Although I’ve been using more natural deodorants for years, it can be hard to find the right one that actually works for you and doesn’t cost a fortune. I hear many complaints that people simply don’t want to use natural brands because they just “don’t work”. This is true, to some degree. They don’t work in the sense that a typical anti-perspirant works. They don’t prevent perspiration. Instead they help to prevent odor, kill bacteria and they minimize (key word) perspiration, rather than full on preventing it. So why be concerned about using anti-perspirant or even conventional deodorants? Many of them contain Aluminum Zirconium Tetrachlorohydrex, which is considered carcinogenic (cancer-causing) as well as having developmental and reproductive toxicity concerns. When you consider using an ingredient like this under your armpits, near your chest and lymph nodes, day in and day out, you can understand how it could be problematic. Your skin is your largest organ. It absorbs what you put on it, and the chemical contents of that deodorant (or soap or body lotion, etc.) ultimately make it into your blood stream. Aside from aluminum, there are many other toxic ingredients in conventional store products. If you’re not convinced, try going to the Skin Deep database, entering the name of the conventional deodorant or anti-perspirant that you use and see how it stacks up. Blocking sweat pores is not a good idea. We were given pores and the ability to sweat by our Creator (who I’m pretty sure it smarter than us) for a reason. Our body needs a way to release toxins, as well as to cool itself down when overheated. Using an anti-persirant to prevent yourself from sweating is messing around with a bodily function that probably shouldn’t be messed with. Even some “natural” deodorant products have ingredients that are less than ideal (although there are some good ones out there). Not only that, but they’re expensive. I have a hard time spending $4-6 on deodorant, personally. Nonetheless, a girl wants to smell fresh, right? After years of frustration with products that didn’t really do the job, I had turned to deodorant stones or crystals. So far, they have been the product that has worked best for me, and I don’t mind using them, but I still wanted to try something different. I had read very varying reports on the use of potassium alum (which is in crystal deodorants). Some say that it is still toxic, maybe not as bad as Aluminum Zirconium, but toxic nonetheless, while others say it is harmless. I’m still torn on the issue. It was time for a new alternative. 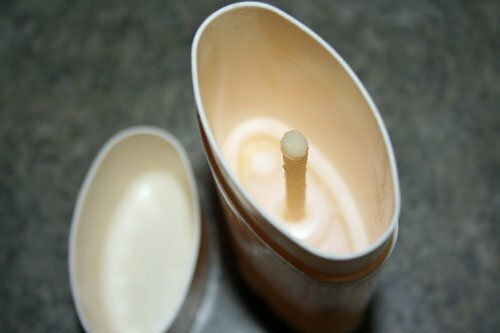 I could find many cheap and simple homemade deodorant recipes on the web, but I really wanted something that would be firm enough to go in a proper container, so I didn’t have to use my fingers. Last spring, I made my first trial recipe that was more firm and could be used in a container, but I was only somewhat impressed with it. Later this summer, I tweaked the recipe, and now I’m loving it! I do have to note that there is a short adjustment period, as there is with most transitions we make to less chemical-filled products. The first week (or couple of weeks) that you use it, you may not find it quite as effective as you would prefer. Once your body becomes accustomed to it (and weaned off of the chemicals it’s used to) it should begin to work well. If my recipe were to be rated on EWG’s Skin Deep cosmetic safety database, it would most likely score a zero (the best rating). It could only potentially score a 1 for the use of tea tree oil, which isn’t necessarily toxic, it’s only that some people who are sensitive could react to it, although most don’t. So, I’d say it’s pretty safe to stick on those armpits! Now which child ran off with the lid for my lavender oil? Add all ingredients to a small pot and put it on low heat on your stove. 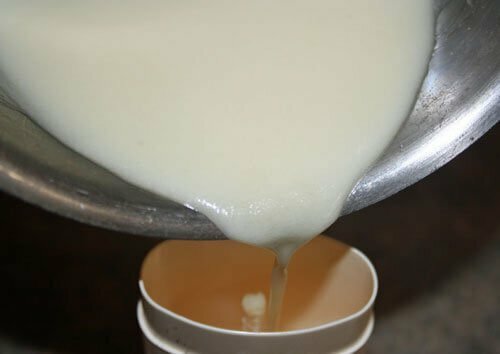 Stir every once in a while, until everything is melted (the beeswax takes the longest, but it’s still within a couple minutes), and then stir well to incorporate the powders into the mixture so that it is nice and smooth. It will be a slightly thick, creamy colored liquid as you can see above. Take an empty deodorant container (that you have previously emptied and washed out- if the stuff that’s in there is conventional it is probably hard enough that it will come out by simply twisting it until it falls out), and wash it out well. Twist it back down so that the the bottom piece is as low as it will go, with plenty of room to fill up the container. Simply pour the melted oil/powder mixture into the container. There’s no trick, it just goes straight in. Fill it right up until the very top, as full as you can. It might look like it is slightly bubbled up and about to spill over the edge, but it will settle a little as it cools and end up right around the top edge of the rim. Allow it to sit on your counter for a couple of hours to completely cool off and solidify. If you’re impatient like me, you can put it in your fridge (once it has solidified enough to move it gently) to make the process go faster. This can easily be doubled if you have more than one container to fill.Don’t make the mistake that I did this past time of shaking essential oil bottles with poorly fitting droppers directly over your pot of ingredients. My dropper lids popped straight off (literally pouring oil into the pot) and I ended up with VERY pretty-smelling deodorant, slightly softer than I prefer because of the extra oil content. Oops! It won’t be as solid as a conventional deodorant stick, so don’t twist it up very high before using it. Twist it just high enough (just a few millimeters, or 1/8 or 1/6 of an inch above the rim) to get what you need, but higher than that and you might smush some of it onto the sides. Don’t overdo it. Especially during the transition period, your temptation may be (as mine was) to put on extra in hopes that it would work better. It won’t. Honestly. Just use a nice, thin amount and the longer you use it, the better it will work for you. That’s it. I hope you enjoy the fruits of my experimental labors and my now beautifully-perfumed underarms. Is deodorant/anti-perspirant one of those items on your “must-switch” list? Has anyone else tried making their own? I will have to try this. I have purchased a coconut based deo before and it works ok. I also tried making my own but didn’t put in all the ingredients you listed. That worked the best, but was very messy and still did not keep me smelling fresh in the summer. Still, the chems in regular deodorant are scary! Where did you find beeswax pellets? @Darleen, Mountain Rose Herbs is a good source. Mine are from Brambleberry, an online soapmaking supply shop. OH! I might have to give this a try when my homemade runs out. It’s a more basic recipe that I love and works well, but the application process isn’t as ‘smooth’, and this is more shelf stable since mine needs refrigeration most of the year (doesn’t contain the wax). Thanks! Ahh I wish I could try this but I have tried making my own with arrowroot and coconut and baking soda. I have made it with and without the tea tree. Both times I have gotten a rash under my arms. The last time I thought I could work through that and once my body got used to it it would be fine. The rash was starting to go away and then it started again 🙁 I am not sure what is causing it. Has anyone else gotten a rash from those ingredients? I have sensitive skin and have to use half the amount of baking soda the recipe calls for and use more arrowroot instead. Since I started doing that, I have had no more rashes. @deanna heuer, I use to make deodorant from a recipe with mostly the same ingredients as this one, it worked great at first except that as you said in time it gave me I rash (I have very sensitive skin), I was able to find that the baking soda was the problem for me, and even using less than the recipe suggested didn’t work for me. I tried many different homemade recipes, and ‘methods’. What eventually worked for me was a spray made of vodka and essential oils. Since the vodka is odorless plus the essential oils you don’t smell like alcohol at all. Now we don’t drink alcohol but I do keep vodka at home to make different cleaners, vanilla extract, etc. I was cramming a bottle of rubbing alcohol with lavender buds, leaves & twigs & letting it ‘steep’ then putting it on with a cloth or cotton ball. The alcohol smell was there but relatively fleeting. I just bought some vodka for a ‘de-mustifying’ spray and hopefully vanilla and will definitely try this idea! 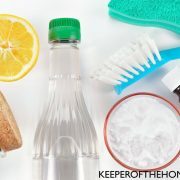 I do not have sensitive skin, but I also break out in a rash from natural deodorants….would love to try the vodka with essential oils…can you keep that mixture in an aluminum spray bottle do you think? @deanna heuer, Deanna, I get a terrible rash from baking soda. I am searching for a deodorant recipe that doesn’t use baking soda, but haven’t been able to find one so far. @deanna heuer, Like someone else said, I’m guessing it is the baking soda. I all but cut that out of my recipe and I was fine. The baking soda really messed with my pits badly. Cut it totally out of the recipe and see if it makes a difference for you. I use a very similar recipe to this, but don’t use the beeswax. I’m guessing that helps it harden up a bit, but I’m prone to irritation from beeswax, and do pretty well with a softer, creamy deodorant that I just apply with my fingertips. @deanna heuer, It might be the baking soda. Some people with particularly sensitive skin have issues with the baking soda. Perhaps try minimizing the baking soda and upping the arrowroot and see if your skin can handle the lesser amount? Try reducing the amount of baking soda. Replace with corn starch or arrowroot powder. I’m sensitive to the baking soda as well. Also, adding a capsule of activated charcoal may help. Good article.. and sure it is effective and good alternative to mainstream deodorant which is so bad for you… ALTHOUGH… you might try something that is inexpensive, effective and easily made…. I quit using store bought deodorant several years ago.. I have been making my own for almost 2 years, I use a combo of coconut oil, shea butter, cocoa butter, vitamin E capsules, arrowroot and baking soda. For the summer I have been thinking of adding beeswax as well, as mine does get a lot softer in the warmth. My husband and I love it. When I began researching making my own, one of the blogs I read said to make sure you purchase aluminum free baking soda, otherwise you are still getting that into your homemade version. I am able to find it at my regular grocery store. All baking soda is aluminum free, it is baking powder that you need to check the labels for. I’ve been making deodorant for about a year. The recipe I use is soft and needs to be applied with my fingers (unless it’s kept in the fridge which is inconvenient for me). I’d love to try adding the beeswax to firm it up a bit. Where do you purchase beeswax pellets? @Allyson @ A Heart for Home, I know that Mountain Rose Herbs carries it. I think mine are from Brambleberry, an online soapmaking supply shop. Thanks for this Stephanie – I have been making my own for about two months and I like the one i started with – It was relatively simple (recipe is on my website) and I like it pretty well, but the only issue I have is that it is not smooth enough. Like yours, mine cannot be rolled up very far. I will try your next – it looks good. Donna – It may just be that you are allergic to one of the items… Take each of them (I would do this on different days) and put a dot of the substance on your skin and cover with a bandaid. If you have a reaction that is the culprit… If not, it is probably something else… Best luck! I’m so glad you posted this! I’m currently testing out from deodorant from Lexie: Lip&Lotion (a friend of mine), and I LOVE it, but she even suggested I try making my own because she said it is easy! I was using a deodorant crystal, but my husband (tactfully) told me one day I stunk! Haha…I’m glad he told me because I didn’t know until then! (Yikes for the neighbors! haha) Plus, the crystal, even though from the health store, still had some questionable ingredients in it (like what you mentioned). Has your husband tried this on himself? I am curious if these homemade deodorants work for men as well. Thanks for posting! @[email protected], Nope, my husband doesn’t use it. 🙂 He uses a regular deodorant, because so far he hasn’t liked any of the natural ones that I have brought home for him to try. I’m hoping to get him to try this at some point soon, but he’s so good about most of the things I encourage him to do that I’ve been happy to let this area slide, since at least he doesn’t use anti-perspirant. Well I’m trying this although I found your recipe half way through making mine… I was just going to add beeswax to mine (which I’ve always made without but I wanted something more stable)… Anyhow my husband kept stealing mine when he noticed how less smelly I was using my homemade deodorant. I’m anxious to see how this batch turns out. Thanks for the recipe! I had found another recipe similar to this one, but with slightly more arrowroot powerder and less baking soda, perhaps because of the skin sensitivities Deanna and Lani mentioned. I’ve been meaning to try it, but now I think I will try both and see which one works for us. Adding beeswax is brilliant. 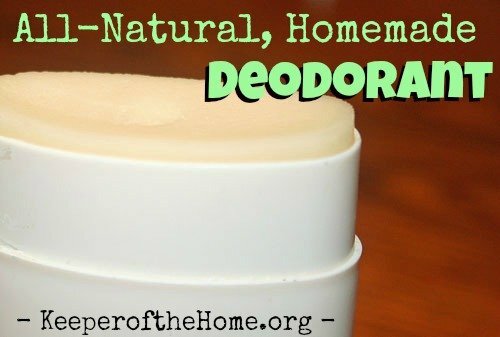 I have never made homemade deodorant before but this solid recipe sounds great. Do you have to pretreat your clothes because of the oils in the recipe? @Martine, As long as I keep it nice and thin, I don’t have a problem with my clothes. When I was being heavy handed, I did have to treat a few of my shirts. So a thin layer is the trick, and then I don’t have any more issues than I would with any other deodorant. I use the Crystal Deodorant spray and it works better than anything else I have tried. The problem I have with natural deodorants is that when they mix with my sweat I smell worse than I would if I used nothing at all. I’ve stopped trying any from the store. Most of them have lavender in them and I really dislike the smell of it. I have made homemade deodorant and it didn’t work at all. I would LOVE to find one that didn’t have lavender and would work for me. I’m happy for anyone who finds one that works for them. Maybe one day I will find one. @Linda, You don’t have to use lavender. You could just use tea tree, and then add something else that you like the smell of better. The lavender does have some useful qualities, but it isn’t absolutely essential by any means. I’m finishing up some and when it’s gone I’ll move to making this. Thanks! I’m glad you posted this. I have an aunt who is severely allergic to practically everything. She asked me a while ago if I knew of any “good” natural deodorants, and I couldnt tell her any. I would like to make this for her, but she is allergic to coconut oil (and palm kernel oil), do you know of any other oils I could substitute? @Kara, Hmm, I’m not sure of what would be an exact substitute. I would consider playing around with things like olive oil, shea butter, etc. but they don’t have the same anti-fungal and anti-bacterial properties that coconut oil does, which is why I use it in particular. I would try googling for other recipes and see if you can find any using oils other than coconut to get some ideas. Also, go to a natural foods store and look on the back of the deodorants they have there, to see what kind of ingredients they are using for oils. I’m allergic to coconut too and I found this recipe. I’ve yet to try it because I have another un-named brand to go through first… but I’m going to try it soon. 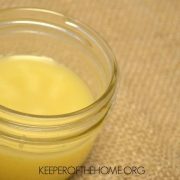 I started making my own deodorant in May using a recipe similar to yours sans the beeswax. I have kept it in my fridge because it has been so hot here (in Louisiana) and it would have just melted on the counter. It did take about 2 weeks for my body to get used to this (thankfully we were not hitting 100 degree temps then!) but this homemade deodorant works better than any store bought deodorant that I have ever used. I have been jogging in the mornings and really sweating and I don’t stink afterwards. @LaTanya, In the heat of summer, mine definitely gets softer but at least it doesn’t actually melt (granted, I live in southern Canada, not Louisiana!). You could consider upping the beeswax content in the summers for a slightly firmer texture, although it might minimize effectiveness somewhat. According to Dr. Mercola, recommends aluminum free baking soda. My daughter has sensitive skin. I am going to try this recipe with Bob’s Red Mill aluminum baking soda and see if it helps. Thank you for this recipe. According to Dr. Mercola, he recommends aluminum free baking soda. My daughter has sensitive skin. I am going to try this recipe with Bob’s Red Mill aluminum baking soda and see if it helps. Thank you for this recipe. @Ruth Norris, It’s actually baking powder that sometimes contains aluminum, not baking soda, although there has definitely been confusion over this because fo inaccurate labelling from a particular company. But even Arm and Hammer or any generic brand should be just fine and aluminum free. I really cannot wait to try this!!!! I’ve been searching for a natural alternative…that actually works! Hurray! This is what I have been waiting for. I can’t wait to try it out. I will be making this SOON! 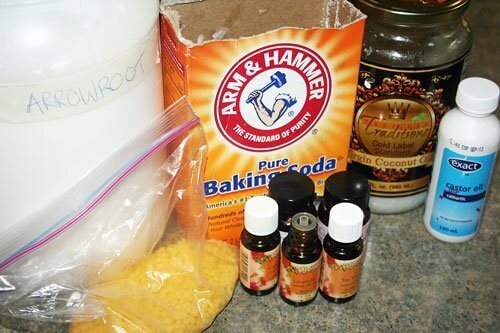 I have made my own deodorant for a couple years now, works great for my husband. For me- embarrasingly not so much. Thank you! Does anyone know where you can purchase the deodorant tubes to put this in? I would like to make some for family and would like to use new tubes, not old ones. If anyone has any ideas, I would appreciate it! SKS Bottle has some- I just ordered a bunch this morning. Think they were around 35cents for the white or natural .35oz ones. I’ve been using 1 part baking soda:6 parts corn starch:3 parts coconut oil. Mix it all, warm in toaster oven, mix together and put in container. I then put it in the fridge so the coconut oil solidifies. Works well but you do have to be careful with putting darker clothes on. I have to admit that since I suffer from a clinical excessive sweating condition I’m reluctant to change deodorants. 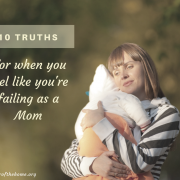 I spent years suffering from BO, changing my clothes multiple times a day, trying every antiperspirant/deodorant on the planet, and throwing out clothes due to odor and staining. Finally I found a combination that worked for me a few years ago (though my white shirts do still eventually stain). I use Secret Clinical during the day and Certain Dri before I go to bed a night. Skin Deep rates Certain Dri at low risk (using alumnium chloride rather than Aluminum Zirconium Tetrachlorohydrex, though Skin Deep doesn’t actually seem to consider that a high hazard substance) so for those who still need an antiperspirant its a decent choice. I’m trying to switch to Secret Clinical unscented since the highest risk factor in most deodorant is the fragrance anyway. I just wish the was a way to smell nice that would cover the times I do sweat heavily in hot weather and the deodorant isn’t quite enough. I’ve hesitated trying natural deodorants due to high cost and I honestly have trouble believing it will even make a dent in my excessive sweating. The highest risk factor in commercial deodorant is not fragrance. It’s the aluminum & other chemicals, which are toxic. Some people are sensitive to the fragrances, but that’s minimal compared to the other. @Laundry Lady, My recipe probably won’t help much for excessive sweating. That’s not what it’s intended for, really. If you did want to try something more natural, then I would lean towards the deodorant crystals. Those have been the ones that I found most effective at controlling wetness. Try using Sage essential oil, witch hazel, & zinc oxide powder. Sage helps minimize sweating by 50% over time, witch hazel has astringent properties too, and zinc oxide is used for absorption & it’s anti-smell properties. I used to make a spray version of this with some Aloe juice as well & I found it worked well but the spray part was a hassle to stand in the bathroom flapping my arms around until it dried :). I plan on making to version tomorrow- I saved an old tube just for that!!!! May I ask where you get your arrowroot? I would love to try this recipe and make arrowroot teething biscuits for my little one, but can’t find an affordable source. Thank you so much for sharing this recipe!!!! @MrsWolf, I second that! I can only find arrowroot in the spice jars – at something like $15 an ounce. @MrsWolf, I got my arrowroot powder from Azure Standard. It was like $4 for a pound…very inexpensive. I second that! Azure supplies it very affordably. @MrsWolf, I buy mine in bulk from Azure Standard. I get a large bag for less than $5, I believe. Wow based on the pictures this is definitely what I will be making this weekend. I have tried to make my own before but it was way to runny. I really want to make some for my mother who is elderly and currently has cancer in remission. I’m trying to help her kick the chemical habit. I’m curious to know what is the purpose of the arrowroot powder? @Syl Grant, It works to keep you a little dryer; like cornstarch, but I believe cornstarch often contains some metal. @Syl Grant, The arrowroot powder helps with wetness, since it absorbs well. Is also helps to bulk it up a little bit more for the texture, since you don’t want to add too much baking soda. For some, baking soda can irritate when there’s too much in the recipe. This is definitely on my list of things to try. 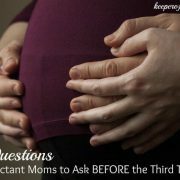 I used all natural store bought deodorant during my pregnancy and it definitely did not work well. As soon as the baby got here I switched back to my good smelling Secret. I will be looking for all these ingredients to try your recipe out soon. Thanks so much! I have been using a homemade deodorant for a while and after awhile I found that /most/ of the time I don’t need anything! @Jennifer, You could also make this recipe using the Thieves oil, which would probably be fantastic! Would you mind sharing your Thieves recipe? I’ve tried to make my own deodorant before, but I think I added too much baking soda. I think I’ll try again with beeswax so that it won’t melt as quickly in the Florida heat. Ooh! I’ll have to try this! I’ve been having issues with my underarm skin lately – bad enough that I haven’t been able to use deodorant at all! I’d been using a natural one but I think it’s been causing the irritation. I didn’t want to switch to conventional, but I did. I’ve been better, but I’d rather go natural if possible! I have been thinking about making my natural deoderant more solid and now I will try your recipe. My daughter is incredibly allergic to metals and reacts to all deoderants with a terrible rash. I made her some deoderant that was just a mix of cornstarch and baking soda in a base of coconut oil and it worked really well but she would like a solid one that she doesn’t have to mush on…thanks for the great recipe! I do make my own deodorant. Mine is always liquid-y, unless I put it in the fridge. Since the fridge isn’t exactly the most convenient spot for a bathroom product, I leave mine in the bathroom even though it’s not solid. I have it in a shallow glass jar and put it on with my fingers each day. I like it a lot, but I can vouch for the “adjustment period”. I switched from an all-natural Arm & Hammer to a recipe very similar to yours (minus the beeswax). I was a little shy about lifting my arms late in the day for a few weeks, but my body did adjust. I really want to get into making my own shampoo and conditioner. Maybe you could post on that soon? Quick question for you: where do you get your beeswax? I have yet to locate an affordable source. I bought some relatively cheap beeswax candles from a deal, but one of my daughters likes them so much she doesn’t want me to grind them up. 🙂 THANK YOU! @Christy, The Simple Homemaker, My mother-in-law bought some bulk and I bought it off her, but I believe she got it from Brambleberry (they sell a lot of essential oils and other soapmaking ingredients). You can also get it from Mountain Rose Herbs, or I know that it comes in the DIY kits from MadeOn Lotion (which include coconut oil, but also include shea butter which is fabulous but not used in my recipe). I buy my beeswax from a local farmer, but I am told that it can often be found at farm markets. You can also find it on eBay (of all places) for fairly cheap. I wouldn’t use beeswax candles as a substitute as sometimes candles contain hardeners. Additionally, I would be careful of where the beeswax comes from, some research has suggested that bees which are treated with miticides will pass those chemicals on to the beeswax. 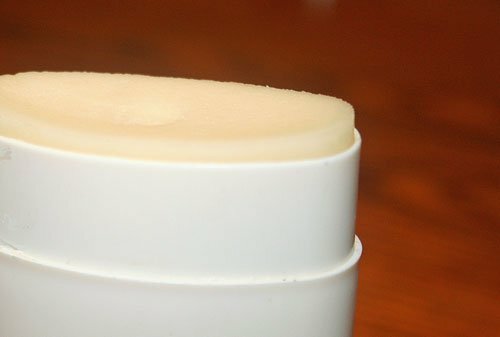 Miticides are harmful to humans, so you really don’t want them in your deoderants, soaps, lip balms, or whatever you are using the beeswax in. Thank you so much for this recipe! I have been buying the most fabulous, wonderful, deo on etsy that is more spreadable than the kind I made for myself before (which was sort of hard) and I love it! It has a few different ingredients, such as clay and cornstarch. However, as much as I LOVE this deodorant (and I LOVE IT!) it is soooo expensive. Yes, I pay $16 (inc. shipping)………YIKES! I planned on trying to duplicate it on my own with trial and error – but now that I have this recipe – I’m going to try this one before heading into the lab (otherwise known as my kitchen)! Thanks! @Shannon, If you end up trying this and add clay to it (you wouldn’t need to add cornstarch, the arrowroot powder serves the same purpose) then I would love to know! I have some clay and have definitely considered doing a trial run using some of it. I’d like to know if there’s ever staining from the oils in this deodorant. Can anyone clue me in? @Savvy Wolfson, I don’t know exactly how long, but it seems like it should be fine at least for a couple of months. I haven’t had one last longer than that yet. I have been searching for a natural deodorant. I have been breaking out with rashes from anti persperant. I think its the chemicals in it , I do know its not healthy. Thank you thank you thank you! My pastor’s been talkin about this stuff for years – BLESS YOU!! I’ve been using a deoderant salt crystal for at least 5 years, and it works fantastic!! The amazing thing is that it looks like I haven’t even used the crystal at all! I think this one stick might last the rest of my lifetime. Haha. However, one side note, I noticed that the salt crystal stopped working for me during my first pregnancy, so I had so switch to a more conventional deoderant until I delivered. However, I am halfway through my second pregnancy and I haven’t had any smelly problems this time. Every pregnancy sure is different! I have been using a similar recipe for 3 years now and love it. I have been frustrated bc over the last 3 years I have worn through my shirts like crazy bc of the staining. It seems like the baking soda slowly bleaches my underarms as well. Luckily most of my shirts are simple tees from Target, so it’s not a big deal to buy a few new ones every year, but it still a bummer. Has anyone else experienced this? @Stephanie @ Keeper of the Home I have been desperately wanting to try and make this. I’ve been allergic to commerical deoderants for YEARS and thought this would be a wonderful option, except I’m also allergic to coconut. Is there anything I can use as a substitute?? @Brandi, I wish I had a good answer for you, but I just don’t know. You could definitely try some other oils, like olive oil, shea butter, etc. I just don’t know if it will work quite as well, because the coconut oil is antibacterial and antifungal, and that’s part of what makes it work. It would definitely be worth trying with something different, I just don’t have any experience with it. Hope you find a solution! Does the lavender oil have a purpose aside from scent? I only ask because I am one of those weird people who cannot stand the smell of lavender. Is there something else that would work the same? @Rachel, It is anti-bacterial, but you could definitely skip it or use another essential oil in its place. Lots of people use only the tea tree oil for that purpose. 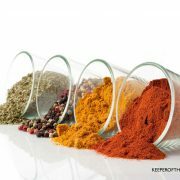 Other possibilities could be lemon, geranium, thyme, grapefruit or cinnamon, since they have some similar properties. I’ve never used any of those myself, though. This is perfect timing as I was getting tired of using my fingers for my current recipe. FYI lavender and tea tree oils are identified as phytoestrogens and I would (personally) not feel comfortable applying them on a daily basis to my armpits and would choose another essential oil. Wish me luck as I try to use an old deodorant container with your recipe! I tried the recipe, and I have been nothing but happy! I even wear it on busy, hot days, and it has been highly effective! I had my husband do a sniff test, and he agrees LOL! Can I share your recipe on my blog? I have been using a knock off brand of Milk of Magnesia for months now and it is wonderful. I don’t use the name brand as it has chlorine in it. I apply with a cotton pad and it works better than anything else I have tried. I have been researching the dangers of over-using tea tree oil and the prolofication of MRSA among the general population. Do you know anything about this? I hope I’m not too late to be commenting on this. My husband and I just made a stick of this deodorant each exactly as your recipe says. I was really happy with the results regarding effectiveness until we realized that our white/cream/light coloured shirts were all getting unbelievable yellow stains in the arm pits. Has this happened to you or anyone else? Is there anything I can do about it? This happens to my husbands undershirts from regular deodorant. I spray the area liberally with plain white vinegar. I let that sit overnight and wash in the morning on the hottest water the item can handle. I have also used plain hydrogen peroxide on the underarm area of white shirts (careful, it can bleach colors) and that works well too. Also, squirting the area with laundry detergent and letting that sit overnight can help. The yellow isn’t from deodorants only, rather from your body stuff (sweat/enzymes/bacteria) mixing with the deodorant. You can get yellow-stained armpits on shirts even if you don’t wear any deodorant. But deodorant does make the yellow worse. Can I use glycerin instead of the castor oil? Do they have the same effect? 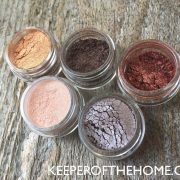 by this method – which i like the most – will all the fine powders stay suspended for an even mix or will they settle to the bottom before firming up? It doesn’t settle. It all stays nicely mixed and it firms up quickly, so there’s really no separation time. If Baking soda contains aluminum, should we be using it in deodorant? sodium bicarbonate (baking soda) usually doesn’t have aluminum in it. it’s baking powder that contains aluminum. Incorrect. Bob’s Red Mill sells a baking POWDER that is free from aluminum, and it is specifically noted on the package with the words “Aluminum Free” on the front. Furthermore, Arm and Hammer baking soda never had aluminum in it. That was an urban myth. My bag of BRM baking SODA I bought recently says aluminum-free. I don’t see one on the website, but I’ve been buying it for years at my local natural foods store. Maybe soda naturally doesn’t contain aluminum, so they quit putting it on their packaging. What is arrowroot powder and what does it do in the deodorant? Is it necessary, or is it possible to skip or sub something else? I have everything else already. Arrowroot powder is similar to cornstarch, and is often used as a thickener. It is also highly absorbent, and that’s why it is used in this recipe. You could potentially sub cornstarch (I just prefer to avoid cornstarch because of the issues with most conventional corn– GMO, pesticides, etc.). Or, you could up the amount of baking soda, if you’re not sensitive to it. Also, cornstarch has simple sugars in it which bacteria love to eat; arrowroot powder has just about no sugars in it, it’s also a lot softer on the skin than cornstarch. What, if anything, could you substitute for beeswax? I’m sure I could get some easily but don’t have any on hand at the moment. Do the tea tree and lavender essential oils contribute to the deodorant’s effect, or are they merely for fragrance? The recipe looks great, and I’d like to try it sometime. Oh, tough question. I’m not really sure about a substitute. The thing is, you don’t actually need it. It’s what helps to give it the nice stay-in-the-container shape and hardness, but you could also just have a softer deodorant that you scoop out of a jar with your fingers. And the tea tree and lavender are antibacterial and antifungal, so they do contribute a bit, but they aren’t completely necessary. Hello, I just tried making this and the coconut oil was just a little and it was just half in the container. I added more castor oil so it can be smoother, is that okay? You don’t want to add more castor oil than possibly a few drops more. It really should be just a small quantity that helps to make it slightly more “rollable”. I finally made this recipe! It is the first time I’ve ventured out into the world of essential oils. I love the scent of this deodorant and it has worked well at keeping me smelling fresh. The problem with it started a few days ago. I started getting some tenderness in my pits. The next day pimple looking bumps started to emerge. The day after that I had at least 15 under each arm. I talked with my herbal friends and they had a few thoughts. The biggest concern with them was the beeswax. They wondered if that was sealing my pores and not letting bad stuff out. In combination with that thought, they also considered the fact of how strong both lavender and tea tree oil is in regards eliminating toxins from the body. I also learned that it is not uncommon for people to react to lavender. So, I guess I’m going to use something that is almost the same, but does not contain beeswax and has lilac instead of lavender. The bummer is I have to wipe it on with my fingers or a cloth. My husband, however, is still using your recipe and loving it. Thank you for what you do here. It is my first stop whenever I have a question on doing something ,ore naturally. My daughter and I have been using this recipe for 2 years and we love it! There was a 2 week transition period while our bodies got used to it, but it works great. We put a little less of the essential oils in it. You could try a few Tbsp of bentonite clay which helps absorb toxins. How awesome! Going to try it. Thank you so much for sharing this recipe. We’ve been using it for several months. It really works well. Just made our 2nd batch. LOVE giving it to my husband and our preteen daughter – so much safer than what we’ve purchased at the store. I add extra tea tree oil & less lavendar oil in my husband’s so it smells more “manly”; and more lavendar & less tea tree in my daughter’s and mine for a more fragrant aroma. Hello, I’m looking forward to trying this. Can you tell me te shelf life of this once its made. Do you need to keep it in the Refrig? Where do you buy the containers for pouring your mixture into, once you have made your mixture? Thanks, for sharing this information on the site. I’m looking forward to sharing this with many of my friends. It’s lasted for months at a time for me. Apart from anything from the rosemarinus genus (lavender, rosemary, etc. ), is there another oil that can be used? I have a member of my household with epilepsy. Tea tree oil is a good one. It has the anti-fungal and anti-bacterial properties that are perfect for deodorant. So I made this recipe with cornstarch instead of arrowroot and no castor oil (didn’t have any). I loved how fresh it made my pits and how long it lasted but here was a problem, it made my pits itchy and turned then very red and kind of hardened the skin. Is this the baking soda? And what would you recommend in its place? Some people do react to the baking soda, so that could definitely be it. You could leave it out or use less and up the arrowroot powder instead. I’ve also found that if I make it more like a hard lotion (https://keeperofthehome.org/2011/03/making-homemade-hard-lotion-with-a-diy-lotion-and-lip-balm-kit.html) adding in some shea butter and a bit more beeswax, then it helps to prevent that. I did have some irritation this summer, mostly when I would use it just after shaving, but I found by hardening the recipe and making it more like this lotion, that went away. Anna, I’ve had that reaction to other lavender deodorants before – it may be the lavender e.o. Try substituting with something else! My 7 year old son has had terrible underarm odor. Last year, I started making my own air freshener and cleaning products, so I decided to research homemade deodorants. There was a wealth of recipes at my fingertips. I made a batch, similar to your recipe (purchased all products from http://www.MountainRoseHerbs.com). Thank you for the info about adding castor oil for a smoother glide. I will, indeed, add it in my next batch. This stuff really works. My son is no longer Mr. Stinky. He came home from school smelling like fresh lavender. The big test was smelling his armpits after his afternoon Kung-Fu class. WOW! I couldn’t believe it. He STILL smelled great! I just made my first batch of deodorant, and I’ve got a few questions…First, mine, even cooking on low, had a lot of bubbles in the pan and as a result of that, the tops of the deodorant sticks are full of bubbles also. Is there a way to remedy this? Also, once I started pouring, the oils and wax got super firm really fast and made pouring difficult. Any suggestions on keeping it more of a liquid as I pour it into the containers? I can’t wait to try the sticks and see how they work! I hate the smell of coconut and the thought of having it that close to my nose grosses me out. Does this deodorant smell coconut-y? If so, is there something I can use instead of the coconut oil? Thanks! Kalani, I wondered the same thing when I switched to coconut oil for cooking. No worries. Coconut oil does NOT smell like coconut. Might I make a correction? There are two different types of coconut oil. One smells like coconut, the other does not. We have both in our house, the scentless one is for cooking, and the coconuty one is for baking because we like the coconut taste! Just not in our hamburger or fried eggs. I don’t know off the top of my head how to tell the difference, but it should say on the jar. I believe the difference is in how processed the coconut oil is. Extra virgin coconut oil will have a subtle coconut flavor whereas plain (hydrogenated?) oil is scentless and tasteless. I agree. Commercial deoderants are highly toxic. 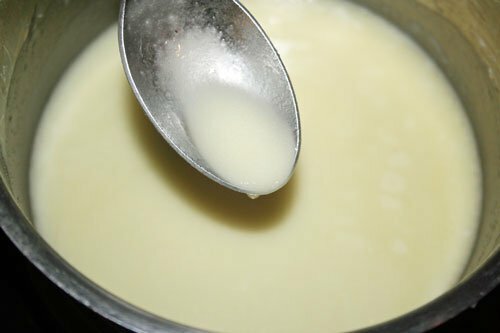 The least expensive and most effective deoderant I’ve used/made, is by disolving 1/4 cup sea salt in two cups of boiling water. When cooled, I put it in a spray bottle. The salt is a natural enemy to bacteria, so, no bacteria-no odor; and, very, very inexpensive. Bumps on skin can be caused by putting ANYTHING on skin scraped with a sharp object (razor). Topicals absorbed can affect lymph nodes in that area….think cancer. Food intake can affect body odor. See “Is This Your Child” (book by Dr Doris Rapp) about allergies causing odor symptoms. Coconut oil seems to keep odor-causing bacteria from growing. I was wondering if it was possible to use citrus essential oils like orange or lime instead of the lavender and tea tree. I really love the scent of citrusy scented things and just thought it would be a great idea to use it in a homemade deodorant. Thanks, and this is a great idea!!! Citrus EO’s should be okay under your arms. Just be careful in the sun, because they are phototoxic and can cause burning in the sun (i.e. don’t sunbathe with your arms over your head!). I use the 1/4 cup cornstarch, 1/4th cup baking soda. 6 to 8 tablspoons of cocnut oil Louana( sure hope I spelled it right) a few drops of my natural essential oils( a floral blend)I mix them in a bowl and put into an empty glass jar (boillion or babyfood) I get 3 jars from this recipe. I keep one in my bathroom and the other 2 in the refrigerator to stay fresh and firm.These last for a long time, I use two fingers to dip out ( index finger and middle finger) some and rub under each arm.This feels and smells so fresh and clean, no white stains on my clothes and lasts through the day, No odor.it works better than any deodorant and I know I am not getting any of those toxins in my body. I really love your recepies! I have used plain baking soda for years because none of the deodorants work for me at all. I smell worse with them on than without. I am glad to see a new recipe for a natural deodorant. we’ve been going more and more natural and I’ve been looking for a good recipe for deodorant. I used the crystal deodorant during winter but it failed in the summer. This is a wonderful recipe and is our go-to deodorant. I can even go a second day and ride 30 miles on my bike with very little odor. Note that this is NOT an antiperspirant. I’ve made about 5 batches now and my very picky girlfriend will use nothing else now. I make 2.5 oz at a time and it lasts about 9 days with both of us using it. I’ve seen cocoa butter as an ingredient to keep homemade deodorants firm. It’s a hard butter. Lavilin just recently came out with their own version of a natural deodorant roll-on. The cream’s more effective but the roll-on’s easier to use. I still use the cream for my feet though. Works brilliantly.